In the mornings I was still a daughter – a long hoped-for child born in early autumn. I opened the door to his study cautiously, afraid to wake him up, but he was already sitting in his armchair facing the window. Without greeting him, I went straight to the kitchen, poured some fresh apple juice into a glass, cut some French toast into small cubes, arranged them on his favourite plate, and pushed the trolley to the study. This time I placed my mum’s string of pearls, a sort of a ‘signpost’ to his forgotten past, next to the plate. Yesterday I spread Meda’s shawl (his present to her, embroidered with elaborate dahlias) over his headboard, but he didn’t even glance at it. “I didn’t sleep at all,” he answered avoiding my eyes and pulling one more thread out of his tattered bathrobe. He looked at the tray, took the string of pearls with two fingers, as if it were an earthworm, and put it on the desk. It had become more and more difficult to guess whether he questioned me because I was special to him, or just out of curiosity. “Oh yes, I have. I got up early and even did my morning exercise!” I always bragged to him like a little girl trying to impress her daddy. I left his room and headed back to the kitchen. After that I was a customer, an irritated client of the health insurance company, phoning to complain rather rudely in a sleepless voice. “Sorry, Ma’am, but you have to make an appointment with the family doctor in advance,” the stranger’s voice explained, then elaborated on the absurd procedure my father had to go through before he could consult his doctor. I lit a cigarette and pressed down my eyelids to prevent myself from bursting into tears. The operator’s voice wasn’t completely devoid of sympathy, but we both knew that contracts were the best means of protecting people from too much compassion. So I brought yet another futile conversation to an abrupt end. “I understand. Thank you,” I said and hung up not having the slightest understanding of the situation. Next I was a furious subscriber to cable television, entangled in engaged tones, left on hold, and desperately struggling to get through. “Please wait… Please wait… Please wait…” Having waited for twenty minutes, my patience was up, and I railed at the operator in a booming voice demanding they restore immediately the channel broadcasting the programme on fishing. After that I was a diligent tenant who pays her elevator expenses in time. Then an impatient pedestrian crossing the street before waiting for the green light. Then a shopper who’s always spilling her purchases from her plastic bag as she goes. And between all these role-playing episodes, which seemed to pass rapidly before me like landscapes through the railway carriage window, I spotted myself standing still on the opposite platform – a real me whom I have always been eager to get acquainted with. My morning chores completed, I went back to my insatiable Dad and set a sports paper on his lap. “Am I not going to have my breakfast this morning?” he asked, switching the TV to his favourite channel. I pointed at the crumbs on his bathrobe to assure him that he’d already had it; I even told him to touch his gums with his tongue to feel the sour taste of the apple juice. But he paid no attention to this reply, looking at the screen and scrutinizing a fishing-boat dragging a net deep through the water with great interest, as if he was seeing such things for the first time in his life. In the mornings, I was still a daughter – an only child, but a perfect stranger to my dad. On Monday, Rita came early, as usual. Rita’s hands were strong, with deep creases at the wrists and swollen, overworked fingers garnished with silver rings. She always took her rings off the moment she arrived, placing them into the crystal ashtray on the dressing-table. I would’ve preferred to see thinner, paler, blue-veined hands resting on my father’s forehead, to see slender fingers gently combing his tousled gray hair. What I’m trying to say is, I wanted Meda, my mum, to be taking care of my poor dad, to be the one brushing crumbs off his bed, talking to him in a soft voice, reminding him of their first date. One evening, several months after my mum’s death, Dad took off his glasses, stared up at me in amazement, and said: “Sallie, Meda is late today, isn’t she?” Two weeks later, Meda – either dead or alive – didn’t exist for him at all. Her place in my dad’s mind first shrank then vanished altogether, not even leaving the tiniest scar behind. When Dad’s grief at her death had become unbearable, I often wished he’d forget everything and live out his last few years in peace. But now, when I see his empty gaze, I wish his Meda died for him daily, leaving him distraught, with high blood pressure, and reeking of the Validol his pillow was laced with to calm him down. “Listen here, girl. He mentioned Meda the other day,” Rita said, trying to make me feel better. “Don’t talk nonsense.” I had already guessed what her next step would be. She busied herself with cleaning her nails, pretending to not care, for her dignity’s sake. Hardly had I finished my last sentence when Rita rushed to the loggia, moved the carpet aside, opened the trapdoor, and disappeared down into the cellar, panting heavily. I opened the window, lit a cigarette, and sank back down into my thoughts about Dad: Does he worry about anything? I wondered. Does he dream when he slumbers the day away? Before this happened, he must have tried to share his thoughts and feelings with me sometimes, but I never had any time for him. Now, I treasure each word he utters and thread them together like my mum’s string of pearls, forming them into sentences that I recite to Rita, assuring her he has indeed said all this. I had recently been reading a lot about short- and long-term memory, but I was yet to fully understand how people could recall previously forgotten episodes, or order the many threads of memory into a sequential chain – one which stored important dates and events, as well as the faces of those near and dear to them, the smells associated with people – everything that really mattered, be they the actual facts of the past, or invented ones. I tapped the ash off my cigarette into a flower pot and looked down into the cellar. “What the hell is this, Salome?! Damn! It’s so heavy!” Rita’s muffled voice rose up from beneath. When I joined her, she gave the dusty jar she was carrying a quick wipe with the edge of her T-shirt and handed it to me. “Wow, Rita! These are sea pebbles! Where did you find them? My father must have kept them there. I used to go down to look at them, I remember now. They’ve been there for thirty years!” I lifted up my childhood, in a glass jar, and held it against the light. Such stupid questions drove me mad. What else could make me feel so happy in the morning? I unscrewed the plastic cap with some difficulty, and emptied the jar’s contents – pebbles kept in water – into a bowl. I remember my mum telling me that the translucent, greenish ones were merely the fragments of the broken bottles that had been buffed smooth by the waves. She said I shouldn’t take them for real pebbles, but I collected them all the same. I put the bowl into the sink and turned the tap on. 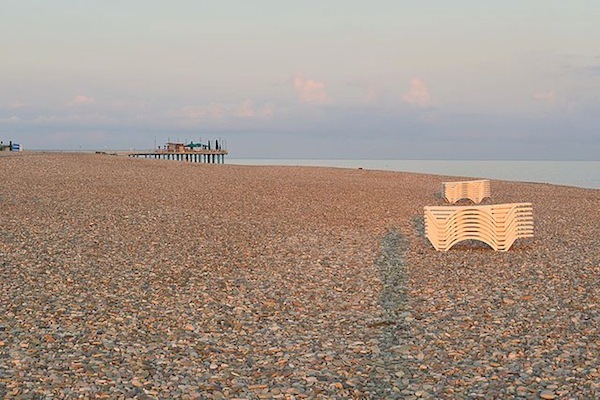 I picked up the pale, dull pebbles one by one and tried in vain to recall why I had collected them, leaving the really beautiful ones on the beach. I remember very well how we spent long, hot days in the Botanical Gardens. Mum always took a basketful of meat pies and a bottle of lemonade with her. She would sit on a rush mat under a Magnolia tree and read a book, while Dad and I strolled through the paradise laid out for us on the small headland till the sunset. Dad was persistently trying to teach me how to identify the Butia capitata (jelly palm) among other types of palms by the shape of its leaves and its love of sunlight. The sound of the Latin plant names bewitched me, so I worked hard to attach the delicate smell of the Abelia grandiflora (glossy abelia) with the euphonic quality of its name. “From the family of multi-stemmed shrubs,” I would say smiling and snatching its white, bell-shaped flower between my thumb and the index finger, shaking it delicately to hear its mysterious sound. I should remind him of that summer, I thought. I had been recommended an old photography studio near the Blue Monastery.1 So, the next day, I searched Mum’s drawers for the old slides. Having found them, I wrapped them carefully in a handkerchief, and tucked them into the front pocket of my handbag. I walked slowly along the old street, called at the Tea House, ordered a cup of Casablanca mint tea, looked for the sunniest spot, sat down at the small table in the corner, and took my treasure out of my bag. I held up the old slides against the light, and the world around me seemed to grow dimmer and more sunless, somehow, as I felt an overwhelming craving to return to the past captured on those translucent films – if only for a day or two. I located the photography workshop easily. It was exactly as I’d imagined it would be: a windowless, sultry room, decorated with fake pearls, hats, and black-and-white photos. “A passport photo?” the old photographer asked me without even saying hello. “No, I need digital images of these old slides,” I answered and began laying out the whole archive on his table. “I can’t do it sweetie, but my son can,” he declared, pointing into the far corner of the room, lit up by a computer screen. “Sasha!” he hailed, stretching his neck out and looking at a young man behind the room divider. Sasha, who was talking with a friend on Skype, signalled to me to wait. A minute later he took my slides, wrote down the fee on a scrap of paper, and told me to come back in the evening. “He can, can’t he?” the father inquired smiling proudly at his son. “Yes, he promised to finish it by this evening” I answered handing him the paper. “See young Booba over there?2 I took that one myself!” The old man pointed to a full-length poster of the celebrity. “Really? It’s nice!” I answered giving him the exact amount of money so as to avoid waiting for change. “You remember his ‘Girls, Buy the Pot-Soil for your Flowers’, don’t you?” the old man smiled, standing up and showing me to the door, humming the melody. Sometimes when he greeted me like this, I wondered if my name had slipped his memory, or if he was just afraid to utter my name in his home too often. “No news,” I said, holding the mobile at arm’s length for a moment to spare myself the inevitable, silly comments. 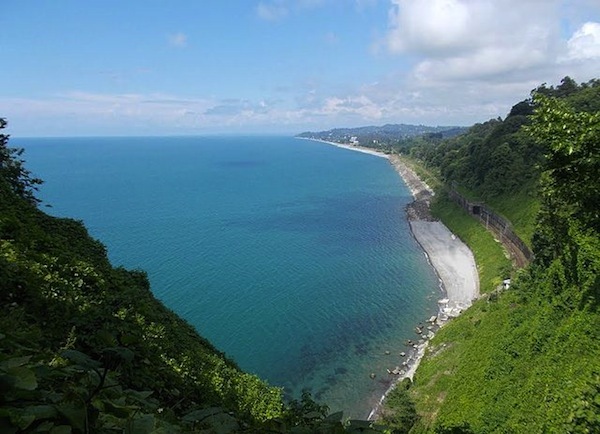 “I’ll book a hotel at the seaside,” he concluded, before trying to decide which off-peak period to pick before the summer started. “Are you kidding?” I said, looking into the mirror and combing my hair. “I’m booking it. It’s decided!” I imagined him loosening his tie. “I’ve cut my hair,” I said. I knew he wouldn’t like this and hoped his annoyance would derail him. “Sallie, darling, let’s start again from the very beginning,” he said, launching into his third attempt. But Irakli could never listen. 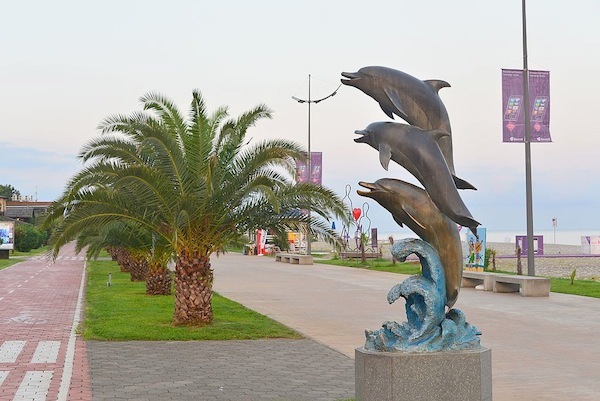 I didn’t tell him that I would actually be at the seaside the very next day, only with another man. After some delay, Rita opened the door. Not waiting for me to enter, she rushed back to the toilet door and leaned against it with her plump shoulder. It needed a special skill to move so swiftly in those huge, ill-fitting slippers. “You’d better buy dried plums for him tomorrow! I’ve been standing here for an hour, at least!” she said, nodding behind her with a grimace, while also straining to hear what was going on inside. “That’s over, thank goodness!” she sighed, raising her eyes to the ceiling. Before I put on my old kimono, so I could feel at home at last, Rita managed to see my dad to his room and help him into his armchair. “Rezo, will you have some chamomile tea, dear?” Rita shouted. “Will you? Eh? Rezo, will you?” At times she seemed to think Dad was hard of hearing, and would start shouting to get an answer. “The cunning old devil can hear perfectly well when he wants to! Watch this: Rezo, shall we have a nice pint of beer?” she asked him, with her hands on her hips, smiling and winking. Dad smiled back and nodded. “Ah-ha!” Rita looked triumphantly at me, and we all laughed affectionately. The three of us had formed a strange alliance over those months of co-existence. Rita and I were both strangers to Dad: he could neither remember Rita’s name, nor recognise me. Likewise, Dad and I were both strangers to Rita, or were until that spring. As for me, I treasured each day I spent with Dad in that house, and Rita became dear to me as well, in a way. “Rita, fill up a tub of cool water and bring it to me, would you?” I said straightening Dad’s collar. “Why? I’ve already washed the floor here,” she protested. Rita always suspected that I thought her negligent. “Come on, Rita! I need it!” I answered and started combing my dad’s hair. “I washed his feet some time ago, girl! I even added some glycerin to the water,” Rita exclaimed, second-guessing me. “You’re all weirdos in this house!” Rita grumbled, shuffling to the kitchen. I brought the laptop from my room and began to set up a little cinema in the study. Dad watched me struggling with the cables with perfect indifference. After a while, I managed to link my computer to the TV-set and switched off the chandelier. Meanwhile, Rita had brought the tub and asked me where to put it. I pointed to Dad’s feet. Shortly after she brought in the jar of sea pebbles too, then left the room somewhat irritated. I emptied the jar into the tub and distributed the pebbles evenly, pressing them down with my palms. As I rolled up Dad’s trouser legs, he couldn’t take his eyes off the screen. Looking at his feet with their gnarled toenails, I couldn’t help missing the younger and healthier man he once was. His weak legs and thin arms weren’t the same ones I used to rely on, as we braved our way into the rough sea. I made him put his feet into the cool water. He didn’t like it at first and took them out straightaway. “Take it easy, you’ll soon get used to the cold. You might even enjoy it!” I told him and made him rest his feet on the edge of the tub. I patted his feet with my wet hands for a while, to help him get used to the cold. A few moments later, he lowered his feet into the bowl and breathed a sigh of relief. I immediately switched off Dad’s favourite fishing programme, and instead on the screen appeared the old photos from our family album. The images were accompanied by the sounds of squawking seagulls and crashing waves, as if to herald a lost summer of my childhood into my father’s room. I had been editing the showreel together all night, changing the volume of the sounds, the sequence of the images and their duration several times until they seemed perfect. “Butia capitata,” I whispered when the photo of my dad and I standing under the palm-tree appeared. In the photo I’m wearing a pinafore dress sewn by my mum; reconstructed out of Mum’s larger dress, to be precise. Dad has fluffy fair hair and is trying to put on his thick-framed glasses. Neither of us is ready for a photo: we are screwing up our eyes in the hot sun and looking in different directions. I was watching Dad for his reaction, but he looked at the photos without displaying the slightest emotion. “Abelia grandiflora,” I continued, seeing the photo of my mum posing stylishly beside the shrub with a cigarette in one hand and her straw-hat in the other. Dad kept silent again, looking at the images with indifferent eyes, but I could see how, on hearing the plant names, he searched his memory, and tried to mouth the words I was saying. “Cercis siliquastrum,” I said when the photo of me laughing beside a Judas tree appeared. “It’s going to rain!” Dad said suddenly in a trembling voice. He was at the seaside! “Nymphaea alba,” I uttered, gazing at Mum squatting beside water-lilies, her elbows popped up on bare knees, her head resting on one of her hands. “I gathered some shells for you in the morning while you were still asleep,” he said, without looking at me and swallowing loudly. “Magnolia liliiflora, Magnolia liliiflora,” I repeated the name of the plant, changing my intonation. “Will you go fishing with me today?” he asked, placing his weak, heavy hand on my shoulder. The next picture was taken on the beach. In it, I’m sitting on an inflatable dolphin between my dad and my mum, hugging their necks. I helped Dad to his feet. 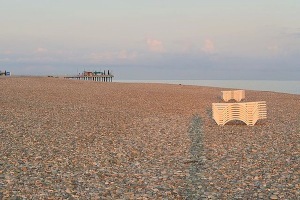 I wanted him to stand on the pebbles with his coarse soles and feel himself there, at the beach. The sounds of the splashing waves and the squawking seagulls grew. My heart raced. Suddenly Dad’s weakened knees began to shake, and he said in a worried, low voice: “Sallie, Meda is late, isn’t she?” Then he nearly fainted. I put him back into his armchair and started to cry: “Dad! Dad! Daddy!” My cries were mixing with the squawking of the seagulls. “Oh, what a terrible thing to look upon! How could he pass away so unexpectedly?! Oh, my eyes! My eyes!” She leaned against the wall and buried her face in her hands. “Is he alive? !” Rita stopped wailing for a moment. “Oh, poor me, poor me! I thought he had died! My dear Rezo!” she cried and started to weep even more bitterly, closing her eyes and trembling all over. We didn’t carry Dad to his bed; we simply dried him with a towel, put warm socks on his frozen feet, covered him with a blanket, and left the room. Rita hugged me as soon as we closed the door behind us and began to cry again, this time shedding tears of a different sort and repeating the same sentence: “I, too, have loan repayments, Sallie! I have no right to stay out of work!” She wiped her tears with her fists like a little kid, stealing a glance at her bag full of jam jars. “Am I not going to have my breakfast this morning?” he asked me, having already had it, and switched the TV to his favourite channel. He was an old man who fished alone in a skiff in the Gulf stream. 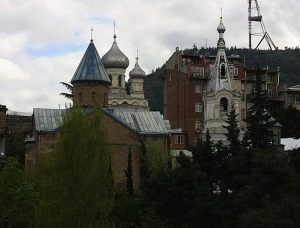 1 A 12th-century Georgian Orthodox church built in the name of St Andrew. 2 Booba: A popular Georgian singer and film actor. Rusudan Rukhadze, born in 1974, graduated from the History Department of Ivane Javakhishvili Tbilisi University in 2008 and completed an MA in Media Management and Journalism at the Georgian Institute of Public Affairs. She has worked for numerous periodicals since 2006, and her first story ‘The Morning Before Christmas’ was published in Literaturuli Gazeti in 2013. In 2014 Intelekti released a collection of her published stories as Tea-Time Stories, which was nominated for the 2014 SABA Prize for best debut. Her second book, One of You Betrays Me, was awarded the 2017 SABA Prize for best prose collection. Tamar Japaridze, born in 1955, is the founder of St George’s British-Georgian School in Tbilisi and a former professor of the Department of the English Language and Literature at Tbilisi State University. 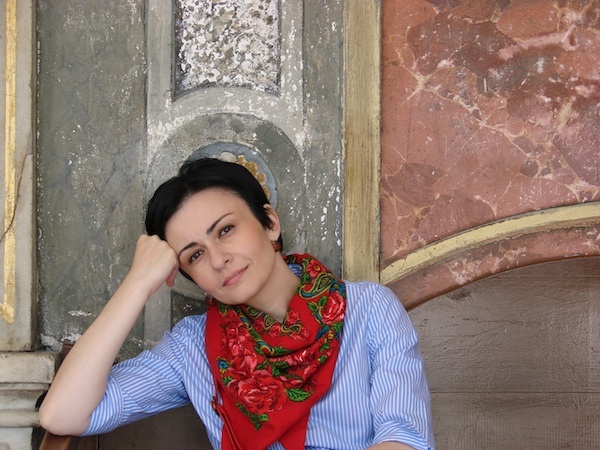 She is the translator of 22 literary works from Georgian into English, and 26 from English into Georgian, including John Fowles’ The French Lieutenant’s Woman, which was awarded the 2016 SABA Prize for the best translation of the year. 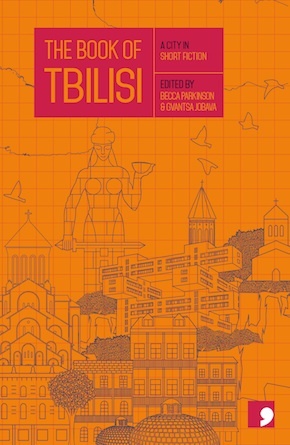 The Book of Tbilisi, edited by Gvantsa Jobava and Becca Parkinson, the latest in Comma Press’s Reading the City series, is an anthology of stories by ten of Georgia’s most exciting and decorated contemporary writers, each translated into English for the first time.